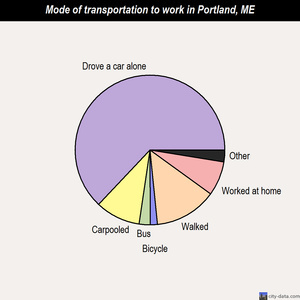 People powered commuting gets locals from here to there with lots of benefits along the way. operator vehicles’, as experts call it. But there is a growing movement of people walking or biking into town every day, all year long, even in the winter. We’re happy to report that a lot of them are using our trails and walkways at least part of the time to safely get around. While reducing traffic is a common reason for people-powered commuting, there are lots of other reasons too. 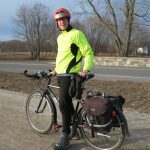 Dan Hogan is the Property Manager at Fore River Management and commutes on his bike almost every day from his home in the Knightville neighborhood of South Portland. He also uses his bike to get to the properties his company manages, which are all downtown or in the Bayside area. 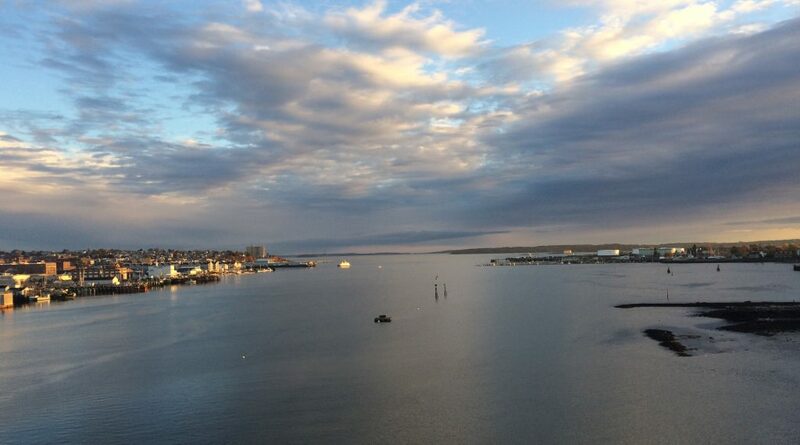 His routes are a mix of bike lanes like the Casco Bay Bridge and trails like the Bayside Trail. “It’s excellent exercise and it saves gas and other vehicle expenses,” says Dan. “It actually saves time getting to our properties by bike rather than walking to the garage, waiting in traffic and parking on the other end. And finally, it’s green!” Dan sees lots of different sights on his rides, and especially appreciates the art he sees popping in the streets and on the trails in the Bayside neighborhood. Brad rocks a great helmet with white lights on the front and flashing red lights in back that make him incrediblyvisible to motorists and other folks on the trail, especially in the darker, winter months. he opts for the bus or even walks all the way to work from the ferry. He says it’s a challenge to juggle the bus and ferry schedules, and often has to catch a boat as early as 6:15 in the morning. But it’s worth it. “I like commuting this way,” he says. “I see so many single occupied cars. Even younger commuters are getting in on the act. 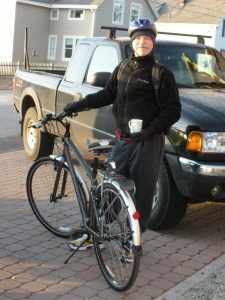 Eli Zelonish walks or rides his bike as often as he can to Casco Bay High School. He can do this mostly on trails, including Canco Woods, the Miliken Brooks Trail and University Park. Being a teenager, his reasons have more to do with necessity than desire: some days it’s the only way he can get to school. He says there are quite a few other students who walk or bike to class as well. There’s actually a name for these commutes powered by human energy: Active Transportation. It encourages modern commuters to look beyond single operator vehicles and reliance on fossil fuels, and explore how we can incorporate more foot and pedal power and public transit into our lives and cities. Walking, biking, taking the bus, even skateboarding–that’s all active transportation. It creates safer, healthier and more connected communities. Maybe this is the year you can give it a try and do your own small part to help Portland move forward to a future less reliant on the automobile and fossil fuels. Plan your active commute with our new digital mapping tool! Learn more.